This week, are heading to Milan for an exceptional visit to the talented architect Cristina Celestino. 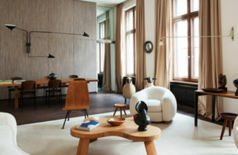 Just settled in, the designer unveils a bourgeois apartment from the 1940s that she has left in its original condition. 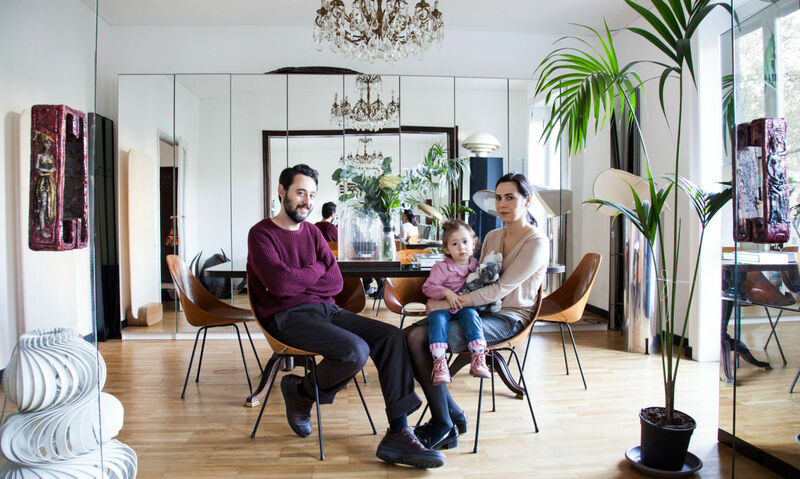 From the door handles to the light switches, Cristina Celestino and Matteo her husband, preferred to keep everything. 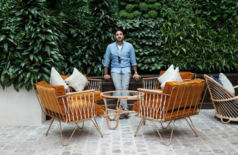 It’s a style that suits them perfectly, and sets the stage for their period furniture and Italian creations. 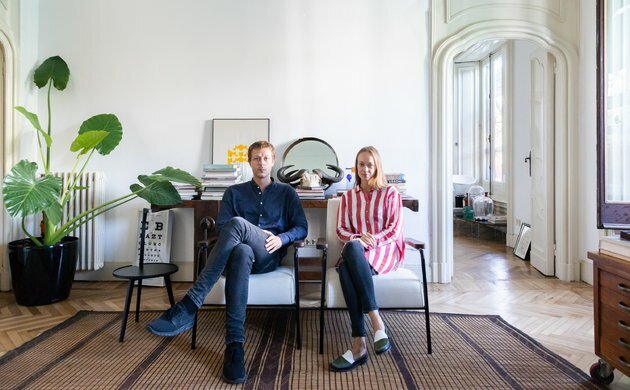 Passionate about Italian design, the couple search for and collect rare pieces. 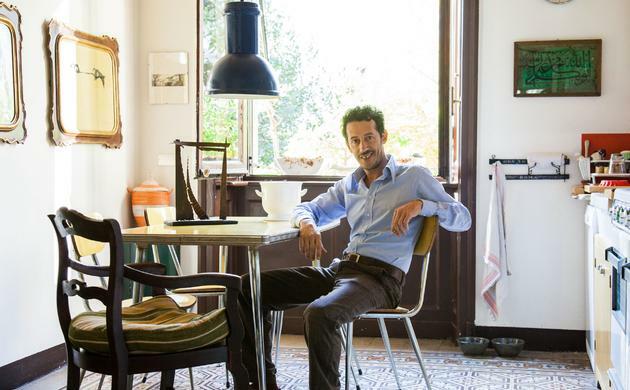 A Gino Sarfatti ceiling light one day, a Luigi Caccia Dominioni chest of drawers another. We gain a better understanding of this very prolific creator’s world, with her crazy talent, always well ahead of her time, who offers you new creations between gallery and unique pieces. Having created for the Brera Design District of 2018 a very ‘Wes Andersonian’ interpretation of the historic 1928 Milan tram, the Italian, for the 2019 Salone del Mobile, puts her name to a very personal version of the illustrious Cucchi patisserie, founded in 1936. From decor to desserts, nothing has been left to chance. Just as we expect from her. P40armchair for Tecno, Osvaldo Borsani. Dimensions H105 x L70 x P80 cm. Vintage Coffee Table Alanda by Paolo Piva published by B&B Italia in the 70’s. An authentic of the 60’s furniture design. Designed by Joe Colombo for Kartell. 1965 reedition. Cristina, can you introduce yourself ? I’m both an architect and a designer. I’m also a collector of design masterpieces. In addition to that I have my own business with Attico. I became an entrepreneur and an editor at the same time, working alongside small to medium sized businesses. Actually my work spans from limited editions for galleries and museums to mass products for major companies and special commissions for brands. How long have you been living here with your family ? We moved into this house in July so a few months ago now. What was it that first attracted you to this apartment ? 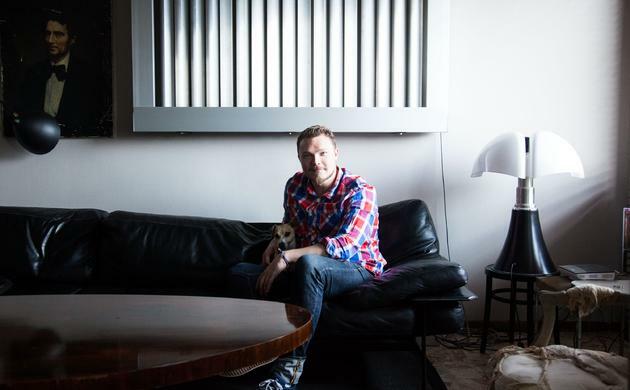 When I visited the space for the very first time, I fell in love with the big living room, its three large windows, the original chimney and the sliding glass doors with ceramic handles. In terms of design, the atmosphere feels like it was back in the 1940’s but with a modern attitude. Did you do the decorating ? Yes I did. The house was empty, except for the dining table, a pair of chandeliers and a golden framed mirror on top of the fireplace. 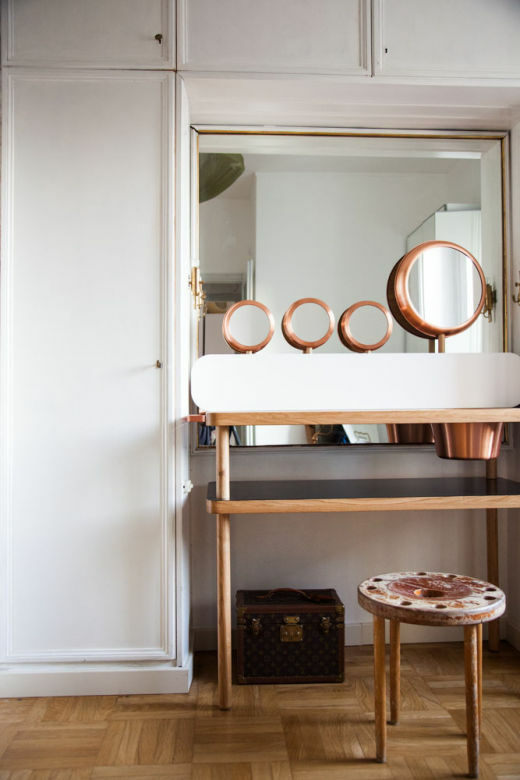 A custom-made wardrobe by Atelier Borsani was part of the original furnishing as well. Concerning the interior decoration, all the pieces are selected amongst our collection of italian design. I just try to fix them in the best position, if it works it’s done. I don’t love paintings or photos stuck on the walls, I prefer objects with their own fullness and tridimensionality. Thermoformed shell seating veneered in rosewood with black metal tubular legs. Tripolino table with pink fringes. Available in several colors. Metal and Murano glass chandelier by Carlo Scarpa for Venini in 1950. Bon Ton suspension lamp made in metal, copper and wood. Where do you spend your time in the house ? Your favorite place ? I spend most of the day working in my little office, between my books and my glass prototypes. My most favourable place is in front of the chimney, on the parquet floor, in the living room. Where do you get your inspiration for Attico ? And for your home ? I got the inspirations for Attico by object observation, even the most familiar ones. I’m curious toward all objects and art forms and I try to find a new attitude for them, both formal and within proxemics and functionality. I really love the fascination for bourgeoisie rituals. I try to apply them in a more modern way to my projects as well as to my house. What is the spirit of your brand ? What kind of person are you thinking about when you are creating ? The spirit of Attico is well expressed by the projects we create, in my opinion. First of all I believe in iconicity, every piece must be new, unpublished and modern. Second of all Attico is familiar, unexpected, feminine and cultured, if you will. I do not think to a specific person whilst brainstorming. These projects are referred to people that adore a warm and sensitive design. How would you describe yourself in three words ? 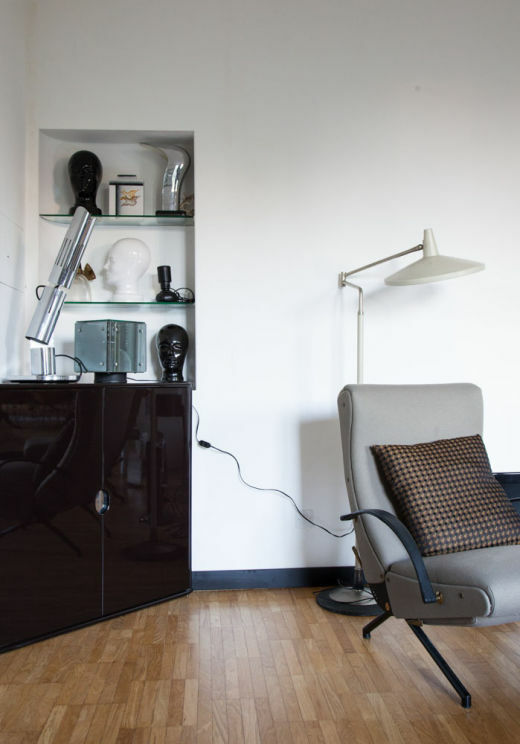 What is your current interior design must-have ? Flower power, a stainless steel kitchen, a Vanessa bed by Tobia Scarpa and Azucena pieces. Are there restaurants that you would recommand us in Milano ? Your favorite design e-shops ? Ebay, Spazio 900 and finally Sightunseen. Designed by Tobia Scarpa for Cassina. Structure of headboard and foot rest in lacquered metal. I really love the fascination for bourgeoisie rituals. I try to apply them in a more modern way to my projects as well as to my house. 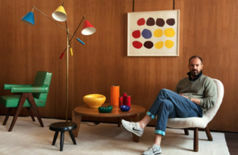 In the Home of a Design Prodigy in Milan. 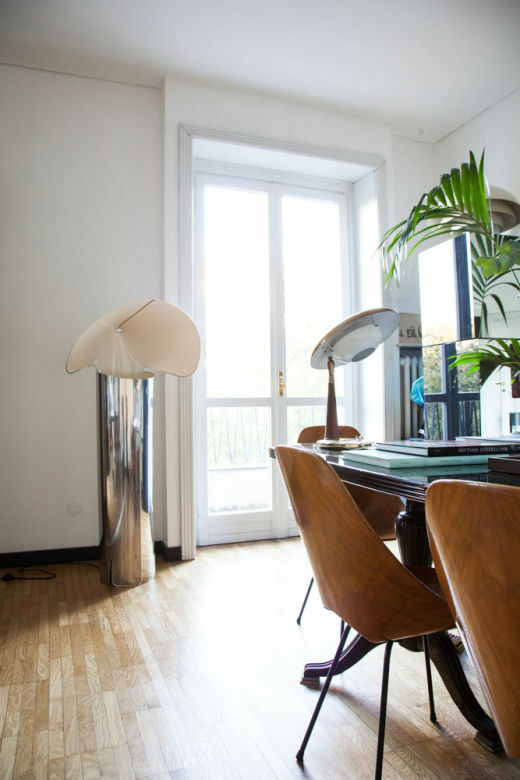 A Milanese Apartment in all its Splendour.